The term parenting style refers to the combination of strategies employed to raise children. John Locke, an English philosopher in 1689, proposed that children are born with a “tabula rasa,” or a blank slate, by which parents could transmit their values or beliefs to their children. How parents transmit their values or beliefs—their parenting style—has a big impact on how children develop into adults. A parenting style is the way parents behave toward their children, and it includes the parents’ rules and behavioral expectations, performance demands, and the style of discipline that the parents use to train their children and to correct misbehavior. There are two main elements of any parenting style: responsiveness and demandingness. Responsiveness is the degree to which the parents respond to their child’s needs in a supportive and accepting manner. Demandingness refers to the parents’ expectations for their child and how much control they employ to ensure that their expectations are met. How these two behaviors intertwine define a parent’s style. A research study has shown that parents who provide their children with proper nurturing and independence, along with firm control, end up raising children with higher levels of competence. These children are also more socially skilled and proficient. Authoritarian parents are very demanding but not very responsive. They are very strict and controlling, and punishment is used frequently. Communication is usually one way (from the parents to the children), and rules are usually not explained. Nevertheless, the children are expected to follow every rule without question. 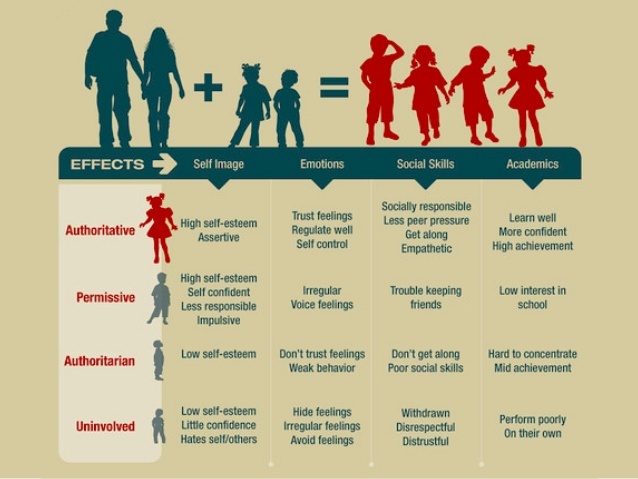 Children of authoritarian parents usually are timid and have low self-esteem. They have poor social skills and are more prone to substance abuse. Moreover, children raised by authoritarian parents tend to become authoritarian themselves, both in their interpersonal relationships and as parents. Authoritative parenting is perhaps the best parenting style. It is a balanced combination of demandingness and responsiveness. Authoritative parents are friendly and more communicative, but they still retain enough authority and control. Clear rules are set, and the reasons behind them are explained. The children are allowed to express their opinions. Expectations are high and the children are held accountable for their actions, but the parents also provide ample warmth and support. Authoritative parents value their children’s independence, which allows children to explore freely and develop self-reliance. Children of authoritative parents have high self-esteem, achieve higher academic success, and are socially skilled and proficient. They are also less likely to develop indulgent behaviors. For example, research shows that teens of authoritative parents are least prone to heavy drinking. Permissive parents are very responsive, but they make very few demands of their children. Permissive parents are very lenient and enforce few rules, if any. Children get whatever they want without restrictions. The parents tend to be more like friends to their children rather than playing a parental role. Children of permissive parents tend to be rebellious, impulsive, and have low self-control, but they are usually more creative and emotionally secure. In uninvolved parenting, the parents do not place any demands on their children, and they are not very responsive to their children’s needs. In other words, children of uninvolved parents have complete freedom to do whatever they want because the parents simply don’t care. They do not spend time with their children, and oftentimes they let TV and video games do all the parenting. Because they grow up with no rules, the children have low self-discipline and, therefore, have a hard time adhering to rules and authority. Children of uninvolved parents are most prone to drug abuse and indulgent behaviors. Verzello, Amanda. “Teens and Alcohol Study: Parenting Style Can Prevent Binge Drinking.” Brigham Young University. Accessed December 9, 2014. https://news.byu.edu/news/teens-and-alcohol-study-parenting-style-can-prevent-binge-drinking.